Really excited to get Evie Ladin and Keith Terry to visit New Mills as part of their tour. 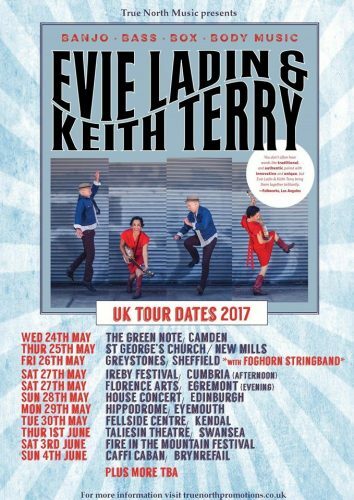 Most of the UK tour dates are now out for Evie Ladin & Keith Terry (check out their page Evie Ladin / Band) – more details on the poster below. Evie and Keith put on a simply breathtaking live show, with superb singing, musicianship (on banjo, bass & percussion) and spectacular dancing – Appalachian clogging & “body music”. More info & ticket links coming soon!